I am a fan of older h/h and love the Dogfather series. Love reading about dogs in books. Cried my eyes out reading Marie Force's series with the dog named Homer - I Wanna Hold Your Hand I think it was called. Bad to the Bone and Trace are my favorites, I think that was the first book I read in the series. Patoct, have you read Roxanne St. Claire's Barefoot Bay Timeless trilogy? All three books feature older heroes and heroines. Titles are Barefoot at Sunset, Barefoot at Moonrise, and (RITA finalist)Barefoot at Midnight. PJ, I have not read those. And don't count me in for the drawing as I have obviously read Bad to the Bone. I've not read this series but have enjoyed her books. I can enjoy any age category. I've had two wonderful dogs but about 30 years ago I had a stray/feral cat with kittens show up and I've been caring for cats ever since. It's funny how pets choose us, isn't it? I'm currently living without animals, for the first time in more than 30 years. It's kind of weird. I've read the first 3 books in this series. Sit Stay Beg was the start of it all. Yes I've read the series with the older gents. It was fun watching her post pictures on her Facebook page. No pets in our house. I am older than dirt, so yes, older hero and heroine would appeal to me. You have introduced me to another new author and new series. Y'all are killin' me. I have loved both cats and dogs. Right now, I am living with a Pekinese I rescued from the streets. He is everything I never wanted - small, long haired and male. He happens to be the love of my life. He has OCD, he is spoiled, he likes other dogs as long as they do not set foot in his house. He makes me laugh every day and as I say, he is wonderful. I love how the pets who 'rescue' us seem to know exactly what we need, even if we don't. I haven't read this series yet, but am always drawn to stories featuring animals, especially dogs. I certainly relate more to older characters, so I should be reading these books! I hope you'll give the series a try, Di. They're wonderful, romantic, heart-tugging stories. I love this series!! I really can't pick a favorite, as it is usually whichever one I'm reading. Each book is awesome and offers the reader a different perspective. I have a 6 year old Yorkie mix who is my snuggle bug and I would love to have Trace train him to be a therapy dog. Thanks so much for the review PJ. "I appreciate when an author includes an older couple as a side romance in a book. I appreciate it even more when they are the main couple in a book. Love and romance are not just for the young. Many couple have strong relationships well into their later years, and many are finding that second (or third) love of their life in their later years. I have a friend who has been married to two wonderful men and been widowed twice. She recently met another wonderful man and married again. The children and grandchildren from all three marriages have blended wonderfully. She is a very nice woman and very lucky woman. Most of us are lucky to find one good man. We have had dogs and cats and dogs are my favorite. We have kept about a dozen over the years. We fostered litters of puppies for the local animal shelter for several years, so I don't really count them, that would be another 50 or so. We are currently down to just 2. We have only had 4 cats. I have had my eyes on this series and am going to start getting them together. I prefer to read a series beginning to end in a binge session. Since the last book should be out soon, I will get to enjoy it. I will actually appreciate the heat level being toned down a bit. At times the heat tends to overwhelm the story and detract from it. I have enjoyed the covers of this series. My understanding is the men are not professional models and the dogs are up for adoption. This makes the covers all the more special." 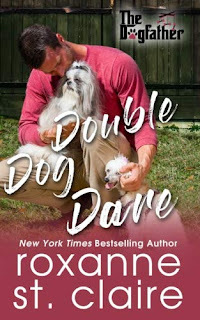 I believe St. Claire has planned another Dogfather novella for Christmas (she published one last Christmas) but the next full-length book should wrap up the Kilcannon family's romances. Fans of the series have also been introduced to the Kilcannon's Mahoney cousins and St. Claire has announced she has books planned for them as well so that's a happy bonus! You're correct that the men on the covers of this series are not models and the dogs are Alaqua Animal Refuge rescues that, at the time of the photo shoot, were either up for adoption or already in their forever homes. St. Claire also donates a portion of the sales from each of the books in the series to Alaqua Animal Refuge so it's a win all the way around.